Ball bearing control creates accurate circles up to 12" in diameter. Complete with pencil, inch and centimeter guide. Safety compass features shortened point. Ball bearing control creates accurate circles up to 12" in diameter. Features positive pencil lock. Complete with pencil, inch and centimeter guide. 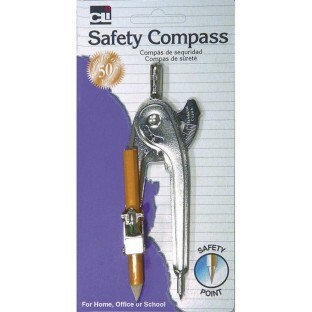 Safety compass features shortened point.